When it comes to iPhone cases, Apple has always seemed to accept the accessories only grudgingly, as if the mere idea of covering its beautiful designs—in plastic, leather, or whatever—was distasteful. The company has long sold third-party cases in its stores, but I suspect this is simply because customers demand them. Apple would prefer for everyone to leave their phones proudly naked. So we were a bit surprised when Apple announced, alongside the iPhone 5s and 5c, that it had created cases for both new phones. I’ve been testing the new $39 iPhone 5s Case, and it’s quite good for a protective shell, with one significant caveat (noted in the update at the end of this review). The case—which actually fits both the iPhone 5s and the iPhone 5—is a rigid shell that covers the back and sides of your iPhone, leaving its screen exposed. 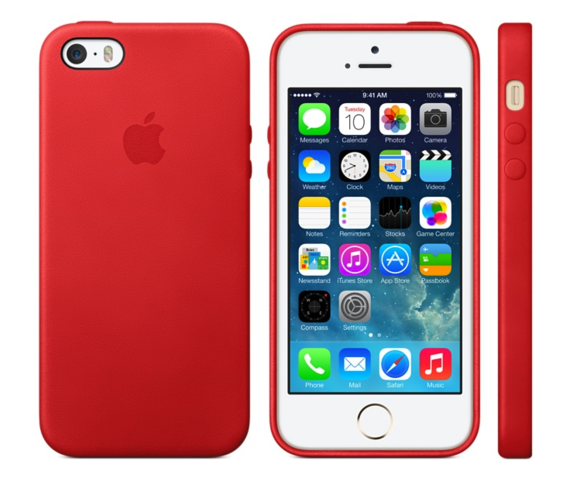 Available in brown, beige, black, yellow, light blue, and (Product)Red red, the case sports a soft-leather exterior with a recessed Apple logo on the back. The inside rear of the case—but not the inner edges—is covered in a soft microfiber. I tested the beige version. 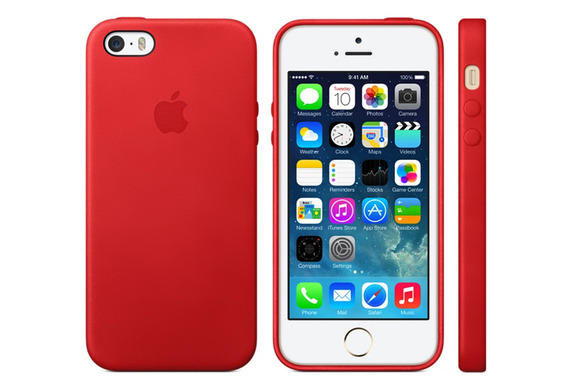 Like many shell-style cases, the iPhone 5s case is thin and light, but most shells are made of thin plastic, not leather. Apple’s offering weighs just 13 grams (less than half an ounce), and it adds only about 4mm to the width and height of the iPhone 5s or 5—even less to its thickness. Your phone definitely feels bigger with the case on, but not at all bulky or heavy. The case leaves a tiny bit of the phone’s metal edge visible from the front, rather than hiding it the way many shell-style cases do—a nice aesthetic touch. The iPhone 5s Case also extends a bit past the screen in front, forming a lip that protects the screen when you place the phone face-down. But because the edges of the case don’t actually wrap around the front, this lip doesn’t interfere with touches, drags, and swipes near the edges of the screen. Overall, the case doesn’t offer substantial padding, but it should handle most reasonable bumps and drops (direct impacts to the screen excepted, of course). The case covers the iPhone’s Sleep/Wake button and volume buttons with custom-molded overlays. These overlays are subtle, but they’re prominent enough to locate by feel. They’re also easy to use, requiring barely more force than the bare buttons themselves. The Ring/Silent switch, on the other hand, is accessed through a hole in the case. Unfortunately, the switch is recessed enough, and the hole is small enough, that the only way I could flip the switch was by using a fingernail. On the back, the case provides an opening for the phone’s camera and flash. Regardless of the case color, the plastic ring surrounding this opening is black. On the other hand, the case will show some abuse if you drop it onto a rough, hard surface, as this YouTube video shows. I do have two long-term questions about the case’s durability. First, given the material, will repeatedly removing the case and putting it back on cause the case to stretch and lose its precise fit? Second, how well will the leather hold up to normal wear and tear? I obviously can’t answer these questions yet, but as Macworld staffers use our cases over the coming weeks and months, we’ll keep an eye out for any issues. If we see any, we’ll update this review with our findings. The beige iPhone 5s case after just two weeks. Get the black one. 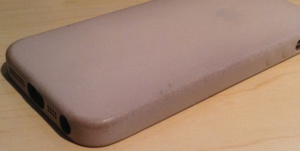 Update 12/18/2013: I originally reviewed the beige version of the iPhone 5s case. Just a couple weeks after this review was published, the case showed significant wear, as you can see in the photo here. During those two weeks, the case wasn’t dropped or otherwise treated roughly—it was either in my hand, in my pocket, or on a smooth desk or nightstand—yet the leather “finish” looked like it was peeling off, and the leather itself had started to discolor from skin oil. (And I’m a person with somewhat dry skin.) I mentioned my experience on Twitter, and to a number of friends and colleagues, and I received a good number of responses from people who had similar experiences with the beige, blue, and red models. (Reviews on Apple’s online store offer similar comments.) Everyone I talked to who had purchased the black version, on the other hand, was very happy. I didn’t receive any feedback, one way or the other, from people who had purchased the brown or yellow version. I took the beige case to the Apple Store where I purchased it, and a store employee quickly offered to exchange it for a different color, commenting that the store had seen a lot of returns for the beige version. I chose black. At the time of this update, I’ve been using the black version for almost exactly two months, and it still looks great. If I look closely, I can see some of the same kind of wear—from skin oils and everyday abrasion—that was so obvious with the beige version, so it’s not that the black version is immune. It’s just that with the lighter-color versions of the iPhone 5s case, that wear is quickly and easily noticeable; with the black version, it seems more like normal leather wear. Apple’s iPhone 5s Case offers decent protection in a minimalist design, it fits perfectly, and it feels and looks quite nice. At $39, it’s also reasonably priced compared to other leather cases I’ve tested, which often sell for $50, $60, or more. All of which is to say that while we’ll soon see a flood of third-party cases for the iPhone 5s, some of which may look nicer or have better features, you won’t regret buying Apple’s case right out of the gate. Which is a good thing, considering that this is one of the cases iPhone 5s buyers will see in every Apple Store—and, at least initially, it may be the only option they see. Update: However, as explained in the update to this review, above, I recommend the black model over the lighter colors, as the lighter versions of the case don’t hold up well to normal wear and tear. Apple’s iPhone 5s Case fits perfectly, looks good, and offers decent protection at a reasonable-for-a-leather-case price. However, some colors wear better than others.